Throw away your stress ball! Studies have shown that just being in the presence of a dog can lower a person’s blood pressure, regulate breathing, and decrease muscle tension- all indicators of reduced stress. In turn, employees become more productive and engaged. According to the American Pet Products Association 2017 Pet Owner’s Survey, 48% of American households have at least one dog. For many of those dog owners, being able to bring their dog to work is a privilege they don’t take lightly: Not only does it allow them to keep their furry companion by their side but it helps reduce the cost of doggy day care visits and eliminate the worries that come with leaving a pet at home alone. Unsurprisingly, 41% of pet owners say that finding a work place that is pet-friendly is important to them. Having your dog in the office provides the perfect opportunity to go outside, get active, and take a break from your work. Whether it’s playing a quick game of fetch or a walk around the block, getting up from your desk and out in the sun helps you refocus and reduce the hazards of sitting too long. If you feel like you’re swamped with work, you can even multitask and take your pooch on a walking meeting! 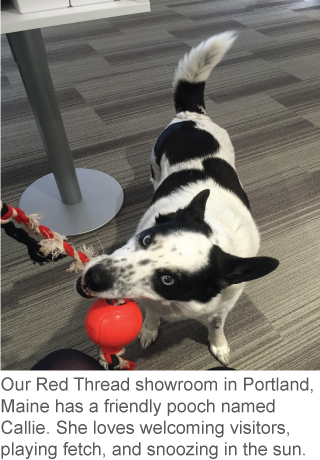 In the workplace, dogs act as a social catalyst. The promise of petting a dog encourages co-workers to stop by your space to chat – getting to know both you and your pooch better! This increased social interaction also has positive benefits on your work: A 2010 Central Michigan University study found that just the presence of dogs in the office helps people collaborate more effectively. Allowing pets in to the office creates an open, comfortable and casual work space. This in turn fosters company culture and boosts morale. According to a recent survey, 65% of dog owners view their dog as an integral part of their family. By allowing employees to bring that family member to work with them, companies show their dedication and compassion for their people. Convinced a dog friendly office is the way to go? If you’re looking to bring your four-legged pal on June 23rd for Take Your Dog to Work Day or on a more frequent basis, here are some tips for persuading your boss.